As part of the environmental history seminar I’m teaching this spring/summer, I have included a few field trips. Field trips are fun and beneficial ways of engaging with landscape and place, putting history into practice, and engaging with one’s immediate environment. The first two field trips took place over the past few weeks. The first was a tour of the Rideau Canal and I had the help of Will Knight (a Carleton PhD candidate and co-developer of a great app for the history of the Rideau Canal). The canal bounds one side of the Carleton campus and we were able to easily walk from our classroom. Hartwells locks are just out the door, and it was an easy walk to other parts of the canal that significantly altered the landscape: Dow’s Lake and Hogsback Dam/Falls. We started at Hartwells and Dow’s Lake – the latter was actually a huge swamp when the canal was constructed, but was turned into a lake by bounding the swamp. The class then headed for Hogsback, and was met by some heavy rain – luckily we made it to the pedestrians tunnels on either side of the dam and under the road in time. The students were tasked with exploring the landscape of the dam and Hogsback Falls, to try and distinguish between what was “natural” and what was “manmade,” what was first nature and what was second nature. Indeed, most people are surprised to find out that the falls, generally seen as one of Ottawa’s great natural gems, was actually carved out of the riverbank in the 1820s as part of the construction of the canal. Additionally, the former path of the river, and the dam that blocked it, are overgrown and unknown to many visitors. The second field trip was the Lebreton Flats and Chaudiere mills area. I had Phil Jenkins, author of a wonderful book on the history of Lebreton flats called An Acre of Time, lead the tour. Starting at the Canadian War Museum, we walked to Pooley’s Bridge, and across the Chaudiere Bridge, ending at the Mill Street Brewery. Phil told about us about the history of the flats, particularly how it was transformed via industrialization, and then expropriated and razed in the 1960s. Also discussed were the decades of planning to “develop” the area, all of which came to naught (e.g. aquarium, HQ of National Defence, etc), until the War Museum and the high-rise condo developments. We also applied our previous readings about sawmills, lumber, and hydro-electricity to consider the landscape and waterscape of the Chaudiere region. Interestingly, just before leaving home for this tour, I saw on the news that Hydro Ottawa had bought the hydro plants owned by Domtar. This is unfortunate, as the area could easily become an Ottawa equivalent of Granville Island or the like – imagine a great tourist area on islands in sight of the national capital buildings! The view of Chaudiere Falls is all but blocked by industrial buildings (those driving across the bridge will get a quick glimpse if they look to the west at just the right time), but perhaps this is best since the grandeur of the falls were many years ago reduced to little more than a cement weir and some rocks. Last week, I left for southern Ontario for five days of research and conferences. I would leave Ottawa, spend a day in Niagara Falls, then on to CHESS in Guelph and CHA in Waterloo. The time at Niagara Falls would involve some research and scouting for my ongoing research on the history of the transnational waterscape of Niagara Falls; CHESS, the acronym for the Network in Canadian History and Environment’s (NiCHE) annual summer school, is a yearly highlight; and Waterloo was the Canadian Historical Association’s annual meeting, part of the yearly Congress. Since I was going to Niagara first, I decided to drive through New York rather than down the 401 highway in Ontario. Not only is the New York route from Ottawa to Niagara a bit quicker according to Google Maps, but I have done the 401 many times and going through New York provided some different sights. I stopped for three chief subjects reflecting my interest in water, canals, and hydro-electricity: Erie Canal, Love Canal, and Niagara Falls. On a trip to New York City a few years ago, I had taken note of places to easily get of the interstate and see the Erie Canal. 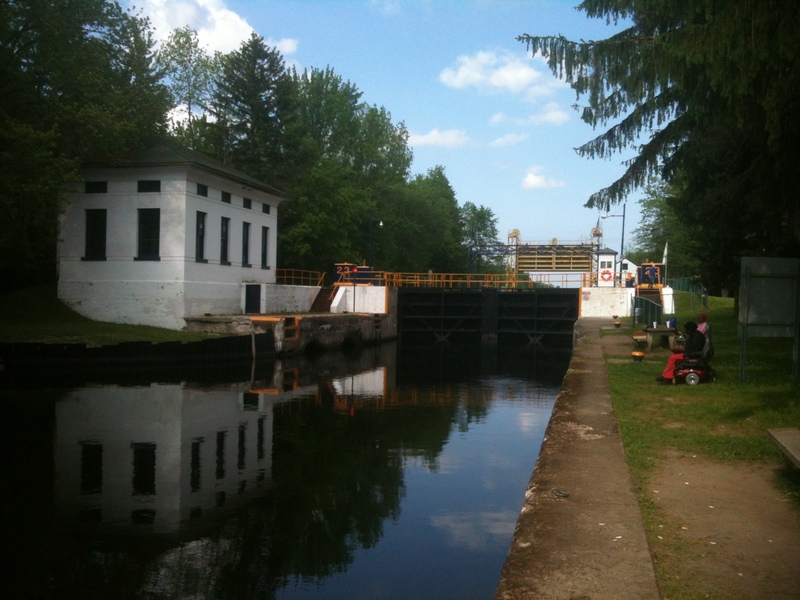 So I stopped at Lock #23 just outside of Syracuse (see pic). I had written about the Erie Canal in my work on the Welland Canal and St. Lawrence Seaway. Completed in the 1820s, it connected Buffalo and Albany, and spurred development of the Welland Canal as a competitor. The Erie Canal was subsequently enlarged several times, but its limited depths meant that it would emerge in the early 20th century as a barge canal rather than a serious competitor to the St. Lawrence and Welland route. It now chiefly serves pleasure boaters. Later that day I made it to the vicinity of Niagara Falls; but rather than turning left after the Grand Island bridge, I made a right to find one of the most notorious places in American environmental history: Love Canal. 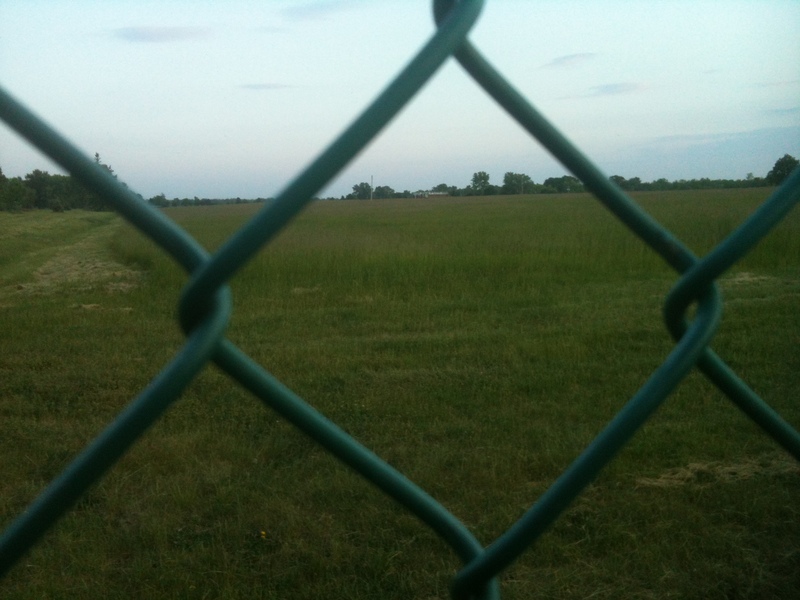 What is now just a fenced-in field (see pic) was in many ways the birthplace of the environmental justice movement. A failed canal dating back to the late 19th century was filled with toxic chemicals by a company, which then sold the property (disclosing the contents). Houses and a school were built over top, but the chemicals eventually began affecting people, and a State of Emergency was declared in the 1970s. 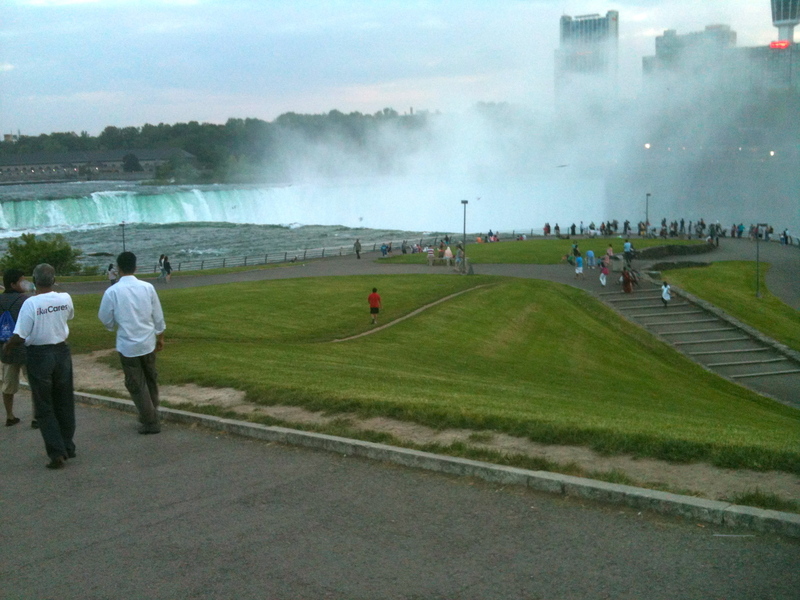 After Love Canal, I followed the path that most tourists take to Niagara Falls. The adjoining picture shows Terrapin Point – it focuses more on the land, which some might find surprising given that an upward tilt of the camera would have better taken in the great cataract. But that was a purposeful choice because Terrapin Point is in many ways emblematic of the remaking Niagara Falls in the 20th century. A transnational 1950 treaty (see my recent Active History post on the subject, and a video I did last year for EHTV) that simultaneously sought to increase diversions from the Niagara River above the Falls (up to 2/3s of the water during non-tourist hours), while constructing remedial works to reshape the Falls to hide this increased siphoning off of water. As part of this process, Terrapin Point was extended by reclaiming land from the waterfall, thus pushing the northeastern end of Horseshoe Falls out of American territory. 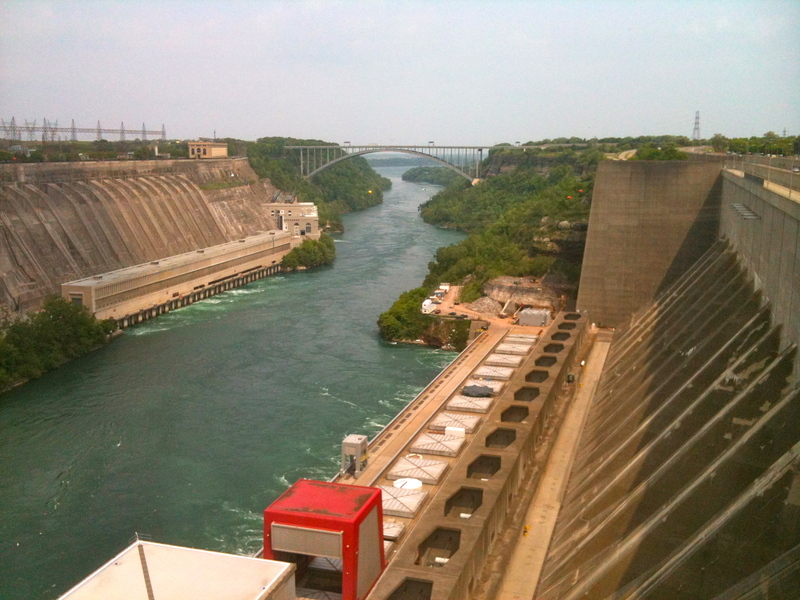 Turning to the hydro-electric element, another picture shows the Canadian and American hydro dams some miles downstream from their intakes above Niagara Falls. The Canadian side involves two dams, Sir Adam Beck 1 and 2, with Beck 2 built in the 1950s, followed soon after by Robert Moses Dam on the U.S. side. 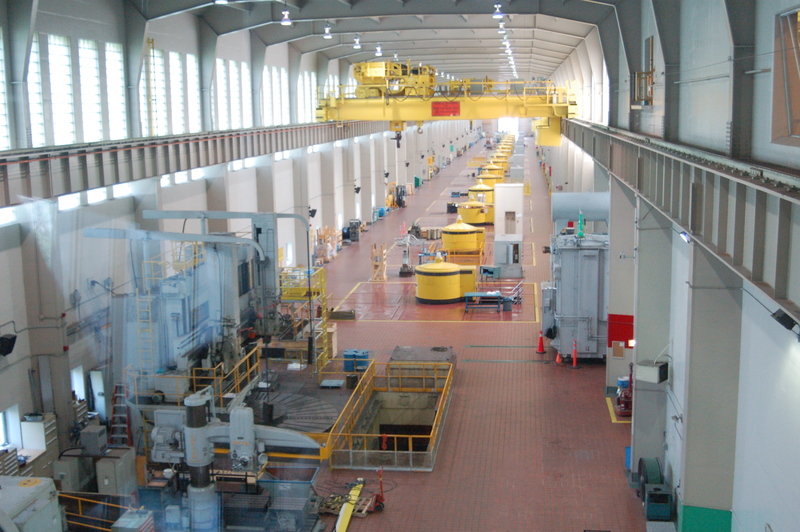 I took tours of both power projects, though the Moses plant doesn’t really let one inside, but has a nice visitor centre (see below for pic inside of Beck #2). All in all, a pretty good way to break up half a day of driving!